Lemon rice. I can literally eat this thing for dinner-lunch-dinner and may be for more meals if there is some left. Such is my current fascination with this tangy lemony bowl of rice with crunchy fried lentils. 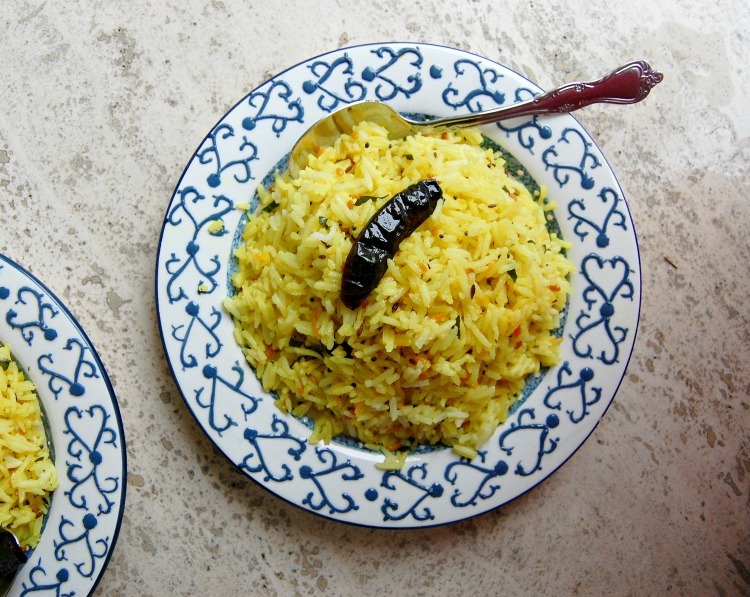 Lemon rice is a South Indian rice dish. 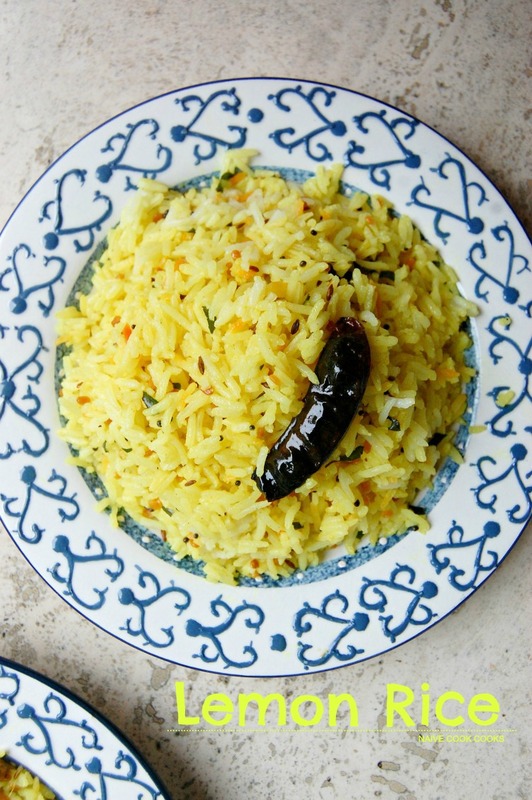 My memories of eating lemon rice goes far back to when I was in 7th grade and my best friend at that time who was from South of India would bring this wonderful rice in her lunchbox. Oh, her lunchbox used to be my favourite lunch and everyday we would simply exchange our lunch boxes as she would eat mine (which she loved as I being from North of India had totally different sort of cuisine) and I would inhale her food in a matter of minutes. That was our little secret. Of all her meals, lemon rice was my absolute favorite and everyday I hoped that her mother made lemon rice for lunch. After she left for another town, I forgot about lemon rice. The only lemon rice I would eat was occasional lemon rice served at restaurants. I never even thought of recreating it even though I have such a fondness for it. Recently I found the exact same flavored lemon rice made by a family friend and boy, it was just perfect. So I had to get the recipe and since then we have had it like twice already and I could no longer hold myself from sharing this wonderful recipe from you guys. 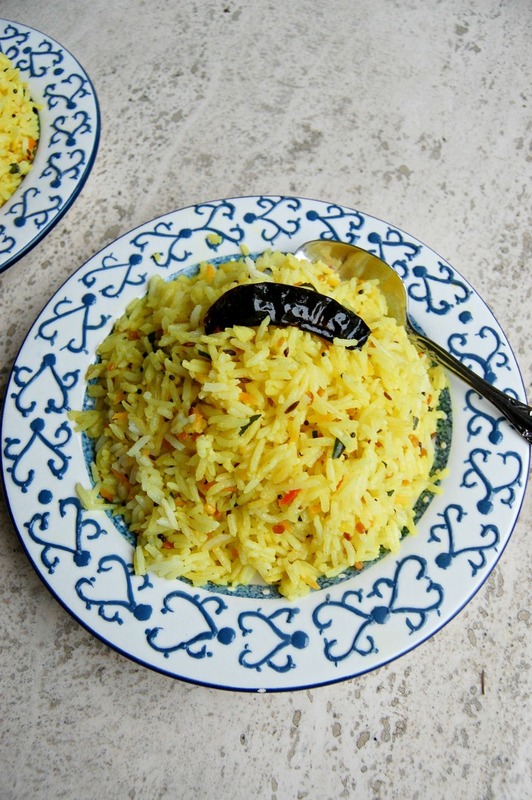 I never knew it was so simple to make such perfect lemon rice! Super simple, super quick to make. Roasted urad dal (while gram lentils) gives it a nice crunchy texture and imparts body to this simple dish. You see that whole dried red chili on top. Yes, that gives some heat and if you are like me who loves to eat spicy, you would break it into pieces and enjoy the crispy red chili with rice. This dish is a meal in itself and you can serve it along with yogurt, a big salad or my spicy black pepper tofu! (BTW this recipe has been featured today on Foodista’s “Blog of the day” section! I love this tofu recipe. One of my absolute favs! In a big bowl, add cooked rice. To it add lemon juice and salt to taste. Mix using hands and adjust salt if needed. In a skillet, add oil. Once hot, add mustard seeds, cumin seeds, red whole chilies dried and white gram lentil and let it cook on med-low for 3-5 mins until cumin seeds and mustard seeds sputter and lentil gets cooked and crunchy. Take it off heat. Add chopped curry leaves, turmeric powder, black pepper and asafoetida and cook it for another minute. Add the tempering to the rice and mix using hands or wooden spoon until it gets mixed properly. Serve as it is or warm up more as and when needed. what a sweet story! why haven’t I’ve heard of lemon rice before? must. make. this. Thanks Mondo! let me know how you like it. Let me know how it turned out Allison. I used to be bad at cooking rice too! I’ve never had this lemon rice before, and now I’m thinking I’ve totally been missing out all of these years! It looks and sounds great! Thinking it would be perfect with some sort of chicken kebab or something like that! Chris, it will taste so good with kebabs, such a genius idea!! It is tangy so you can adjust lemon to your taste if you don’t like too much tang. Let me know how you liked it!